My friend Lisa Niedermeyer, an amazing dancer and choreographer, sent me this wonderful quotation just now. 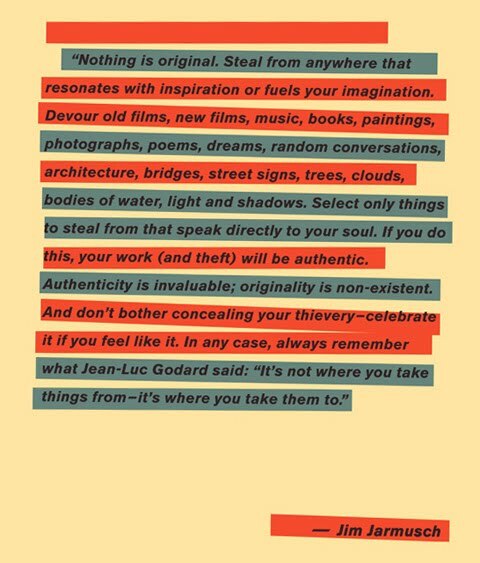 As I have written before, especially around the release of our fourteenth album Sister Holler, this notion that “Authenticity is invaluable; originality is non-existent” saved me from a life of non-art. 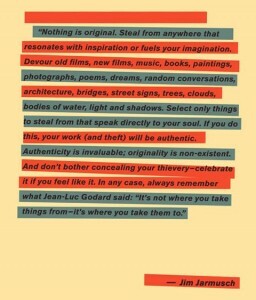 When I was a child and a young teen, I used to lie in my bed in the morning and despair about the notion of originality. Every good idea I had seemed like it came from somewhere else. Plus, there were only twelve tones on the keyboard; how, on an earth of 5 billion people (this was the early 80’s), was one expected to make up an original melody? Nope, sure can’t. We each really do have our own gift to bring to the world, and I got it that day back in 1986. After that insight, I started writing songs again after a hiatus of three years during which time I thought my chances of ever “going anywhere” as an artist were so slim it wasn’t worth even writing for fun. What a waste of three years! I had a similar insight last week in yoga class. I’d been going on the notion that I would never really be a yoga teacher because I doubt very much that I could ever do this: In fact, I doubt I will be able to do seventy percent of the poses in my text. So what? 2. tons of great teachers had mediocre chops, across the board. What is it they say? If you can’t do, teach. Katryna and Dave came over yesterday and at my dining room table with Martin guitars in our laps, we played through a bunch of songs I’ve been writing over the course of the past three years. Some of these songs haven’t really seen the light of day, and it had made me sad to think they never would. I’ve been so busy with motherhood, writing books, running my workshops and loving my clients (not to mention my yoga practice) that I haven’t taken care of my songs properly. Yesterday they got to come out and play, stretch their legs and canter around. Katryna and Dave had all sorts of fabulous ideas for arrangements, and we set up some dates to record them. Afterwards, I felt more mentally healthy than I have in years. I think artists need to be listened to, seen. Actually, I think we all need that. (Really, actually, I think we are all artists.) Our new CD still needs a good title, and there might even be a couple more songs to add to the pen, but I can see it now, and it’s thrilling. The idea that we need to be original seems old and quaint to me now, as incongruous as a Betamax. Of course we will be original, because no one has lived our lives and has had our experiences. Of course we will overlap too, because everyone has lived lives and had experiences like ours. Our only job is to be authentically ourselves as we write, learn, arrange, perform and edit. Keep asking ourselves: is this what I want to say? Is this the way I want to say it? And to keep working at it until we get to yes, yes. The notion of not comparing oneself to others was liberating for me as a yoga student. I had to be reminded that each body is different, just as each moment is different (cue the Kennedys singing “This Moment”.) The important thing is finding the point where the pose works for you, and ignoring where others are on the continuum. Conclusion: We need teachers, yoga and otherwise. But it has to be the right teacher. I don’t know whether George Martin is a good singer or instrumrntalist, but he was more of a guru than the Maharishi ever was.